Have you ever had one of those "aha" moments in your life where clarity was immediate? I have had many moments like this over the last three decades as an entrepreneur, teacher, and parent. I wanted to share a personal experience with you that deeply influenced the content of my soon to be released book, It All Matters. "Individually, you matter too much to far too many people to not matter enough to yourself to live your life to your greatest capacity." I have a deep passion for the youth of today because I know they are our greatest hope for a better future. I believe if they are given enough encouragement, support and guidance there is no goal or dream they cannot successfully pursue and achieve. I will never forget the magic that occurred during my visit to Battle Creek. The young people almost immediately engaged and participated as the speech unfolded. I wanted to deliver a message of hope and enthusiasm that would inspire and impact every student to believe in themselves and their future. I met young people who had lost their hope and felt they didn't have a future. I spoke with a large group of students after the speech who were filled with questions and curiosity. I had three seed thoughts I wanted to leave with every young person in attendance. I told the audience, "You came to this earth equipped for greatness and designed for maximum accomplishment from birth. You were never intended to play small in the world or to settle for a life of less. You are truly unique, one of a kind and rare. You are an individually hand crafted master piece with immense value." One young lady stayed behind and waited for all the other kids to finish with their conversations. When she approached me she had the brightest smile, and an extraordinary energy in her eyes. The minute she spoke I knew I was in the presence of a very gifted young person. Eloquent, articulate and insightful are the best words I can use to describe our conversation. I will never forget the question she asked me that day. "Do you believe a person like me can achieve big dreams? She went on to share her personal story. "I have so many obstacles in my life. Some days I don't even know where I will sleep or if I will have food." I asked her a question that I ask CEO's of major corporations all over the world. Moments like these stick with you. They get in your head and heart space and make noise if you are a person who desires to see things better. She impacted my life. Is it too much to ask for a chance at a better future? I don't think so. I was determined to do everything I could to create more hope and opportunity for her and the other young people I met that day at Battle Creek in Michigan. 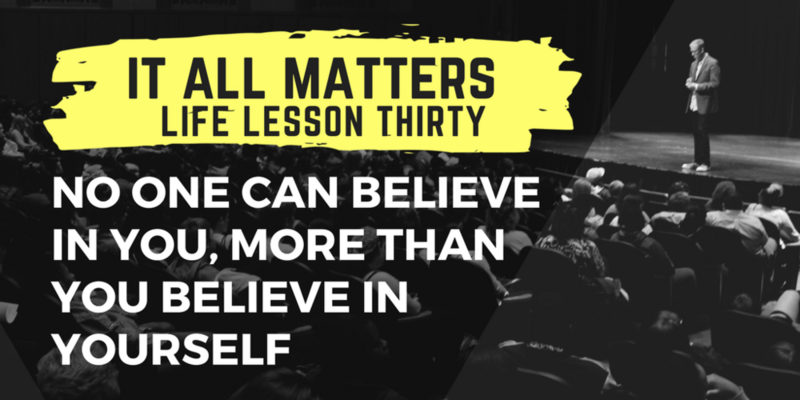 As I flew home that day, I made a committed and congruent decision to include a life lesson plan in my new book, It All Matters that would inspire a generation of young people to go forward with confidence, clarity, certainty, and creativity. It mattered too much for me not to rethink my existing narrative, and take action immediately. I am happy to report; my book includes 125 life lessons written and shared because of my conversation that day. This young lady influenced my approach to creating a book that would make a real and lasting difference. Pre-order your copy of It All Matters from your favorite book retailer today. Click here to tweet this story and the image below to your friends and colleagues.